Question paper generator is software which prepares different types of question papers for new Telugu states (Andhra Pradesh and Telangana) board syllabus based on common and comprehensive evaluation pattern. Nowadays, preparing an effective question paper is not an easy job. Whereas the question paper generator makes this task much easier with 3 simple steps. All typical questions are formed by subject experts as per the academic standards. QPG tool mostly useful for teachers as well as students also. The teacher can prepare a question paper based on level of difficulty for various exams like unit test, quarterly, half-yearly and annual. 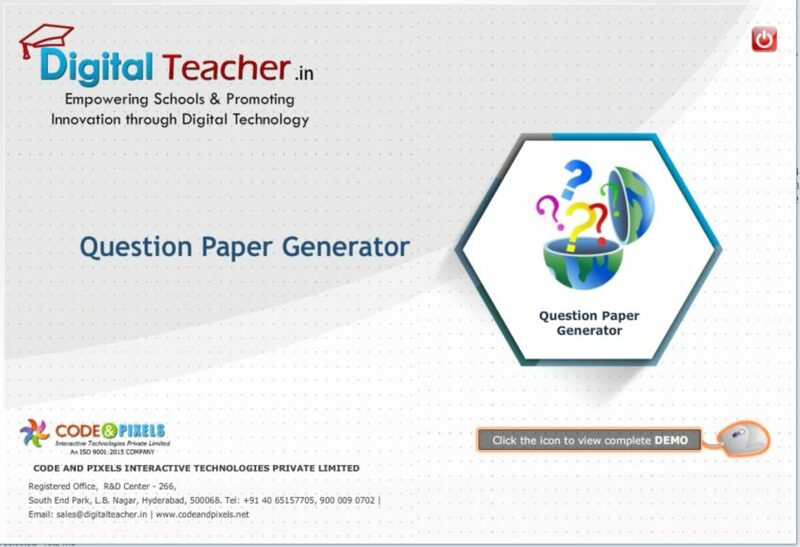 Question paper generator is a product of Digital Teacher and for a greater flexibility, all question papers are set according to user defined. Digital Teacher promotes new modes of learning and developing path breaking products and solutions. It also leverages information technology and the Internet to make the education system more effective. Question paper generator provides user preparation facility and pre-defined papers. The digital teacher qpg has built with more than 20,000 questions.